Last week the veil was lifted on a question at the center of both the East End’s culture and its economy: How many Peconic Bay scallops made it through algae blooms, whelk attacks and underwater landslides and landed on dinner tables this season. Sunrise on Monday, Nov. 6, marked the opening of New York State waters for harvesting this sweet local delicacy and, by 7 a.m., it was clear there were plenty of scallops to be taken. There are many ways for a scallop to die before its time, and biologist Stephen Tettelbach is familiar with all of them. 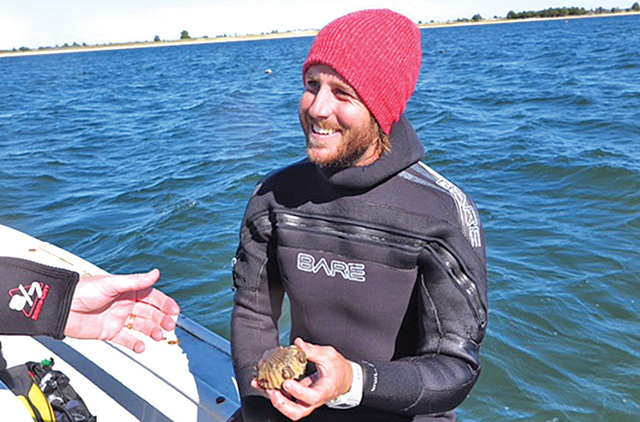 A professor at Long Island University, Mr. Tettlebach is the co-leader of a scallop restoration project run out of the Cornell Cooperative Extension Marine Program in Southold. That program has helped increase commercial shellfish revenues to the local economy by $8 million since 2006. He measures program success with data gathered from 20 dive sites in the Peconic Estuary, where he records the number, size and condition of bay scallops using forensic techniques worthy of a medical examiner on a murder case. There is a story in every shell. A slight ridge indicates that a scallop has been affected by some shock, such as an attack by a crab or a toxic algae bloom. A notch in the edge of the shell is the telltale sign of attempted murder by a whelk. The position of the scallop’s growth ring indicates its age, but also the speed of growth, and how favorable conditions in the bay have been. Mr. Tettelbach has also documented wintertime mass burials of hibernating scallops when underwater sediments shifted, and the scallops didn’t escape. On a recent dive, he was joined by Scott Hughes, a Cornell marine resources specialist, and graduate students Marissa Velasquez and Steve Heck. Examining the bay bottom at four scalloping sites — Cedar Light, Sag Harbor, Barcelona and Split Rock — they documented improvements in the density and size of the scallops at those sites over 2016. “There were a lot of smilers!” Mr. Hughes said, bobbing to the surface after a 10-minute dive in Northwest Harbor. That’s marine-biologist-speak for big, adult scallops opening their shells wide to feed on plankton. At the Sag Harbor site, Mr. Tettelbach surfaced with an 86-millimeter bay scallop in his collection bag, one of the largest he’s ever found. Back on the boat, the team measured and recorded the size and condition of each bivalve as the boat rocked and the wind blew. Then they threw them back, including the one that was bigger than a baseball. The tiny, tasty shellfish used to be worth $1.5 million a year to the East End commercial fishery. But hard times fell in the mid-1980s, when a devastating brown tide — an algae bloom fueled by water pollution, especially nitrates and phosphorus associated with human waste — dealt a shocking blow to all shellfish, but particularly the Peconic Bay scallop. Last week, things were looking up when Shelter Island bayman Steve Lenox, on the way to Northwest Harbor at dawn, remembered opening day in 1985, when he and his brother headed out to toss the first dredge. That year, the much-anticipated first day of fishing was his brother’s birthday, and the dredge came up full of empty shells, Mr. Lenox said. It was an environmental and economic calamity for the region, but it got the attention of legislators and spurred a number of clean water initiatives aimed at reducing nitrate and phosphate levels and improving water quality in the estuary. Although there have been other less harmful algae blooms, there has been no repeat of the brown tide in the Peconics since 1995. No one notices an algae bloom in the bays more than the commercial fishermen who spend time on and in the water. So the scallops are coming back strong. In 2006, the restoration program headed by Mr. Tettelbach began to support wild bay scallop populations by planting millions of larval scallops. The results have been remarkable, with overall annual Peconic Bay harvests from 2010 to 2016 coming in nine to 30 times higher than average annual harvests in the decade before the program began. The Peconic Bay scallop, one of the disappearing foods brought aboard the Slow Food organization’s “Ark of Taste” — an endangered species list of American foods — is back on the menus of New York’s fine restaurants — and back on the delivery list this fall for Fresh Direct online grocery customers. Southold Fish Market reports selling over 400 pounds of scallops to Fresh Direct in the first week of the 2017 season. Scalloping is a hands-on job, and by the end of the day, the culler on a scallop boat has examined every one for size, maturity and liveliness. The work requires expertise in the life cycle of the Peconic Bay scallop, because getting the largest, sweetest, most marketable bivalves depends on understanding the physiological changes that take place over the mollusks’ two-year lifespan. By November, when scalloping season opens, the adults have recovered from spawning, developing a deeper and more globe-shaped shell with a slightly raised ring, and are ready to eat. It’s this growth ring that baymen look for when they bring up a dredge-full of scallops. Juvenile scallops without a growth ring go back into the bay to grow another year and spawn. Scallops spawn once, and the adults die of old age during the winter months, so there is no guilt in eating an adult bay scallop. The size and number of bug, or juvenile, scallops in the 2016 season was the largest in anybody’s memory, a good sign for the health of the fishery. But the size of the juvenile scallops also presented a problem. “I heard they were writing a lot of tickets,” said Nate Phillips of Alice’s Fish Market in Greenport, describing DEC efforts to curb illegal fishing of juvenile scallops, which he was glad to see. At least two of those tickets were issued this past winter to fishermen in the waters off Shelter Island, when New York State DEC officers determined that 15 percent of their total catch consisted of juvenile scallops. In most years, the DEC does not write a single ticket for illegal fishing of juvenile scallops. In 2016 twice as many tickets were recorded as in any year in a decade. Baymen are reporting that they see very few juvenile scallops, especially compared to last year, confirming what the scientists are seeing. Once nearly extinct, Peconic Bay scallops are back, providing a winter boost to the East End economy.